I'm Bonnie, otherwise known as Hermia or @bjr70. 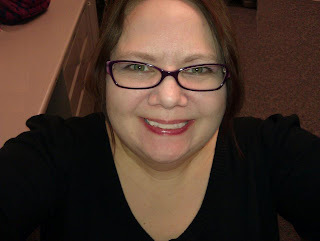 I'm 42, and I work for a small university press in the Detroit area as a Technical Project Manager. I run all of the systems, the website, and help guide strategy in multimedia, social media and digital publishing. I've been in and around the fandom since 2008, when a friend of mine sent me LolaShoes' "Let Your Light Shine" with the message "This is what Breaking Dawn should have been." While I've never written in this fandom I've written fic off and on since I was about 12 years old. I wrote Duran Duran fic with my friends at school before I knew what a fandom was. Mostly I've written slash one-shots for various fandoms over the years, including music and scifi fandoms. I'm a geek who loves science (physics, astronomy, archaeology, paleontology), indie films, cult films, indie music, and reading. My favorite show at the moment is An Idiot Abroad: the Bucket List. I'm looking forward to meeting everyone, and to having a great time in Vegas. Anyone want to hit The Big Shot with me?